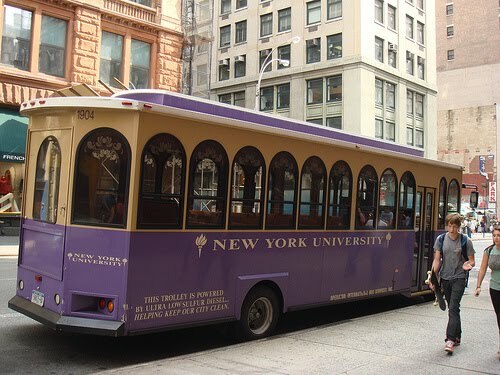 Caught amidst what is surely the biggest scandal of the 2014-2015, the NYU Transportation Department is expected to respond to claims the famed NYU Trolley is not a trolley at all, but in fact a bus. A student from NYU’s Polytechnic School of Engineering released a 45 page essay which derails (no pun intended) the widely held notion that the NYU Trolley is an electric vehicle guided along the street by a track or rail. To further add insult to injury, the student released detailed schematics that eerily resemble the mechanical makeup of an urban bus. “It’s all right there,” said an engineering professor in response to the schematics, who requested his name be kept anonymous for fear of retaliation. “See the wheels? Dead give away that it’s a bus. It’s like they weren’t even trying.” The professor speculated that to the untrained eye the bus would resemble a trolley, due to its charming appearance and trolley-like qualities. Students from around the campus protested in outrage, although their voices largely fell on deaf ears after none of them could correctly identify which building belonged to the NYU Transpiration Authority.